New version - BETA. Fix for many 7.3 issues (bank fixed). Missing settings, will add it back soon! Fixed issue where bank bags were not "locking"
Really nice addon but I am getting these lua errors at the moment. Any idea why or if there is something I can do? PS: as a disabled gamer, I'd love for there to be an X or "close window" button for the bank AND inventory bag windows; would that be hard to implement? Last edited by bartg71 : 11-23-17 at 11:16 AM. This is an amazing addon. I was just wondering. 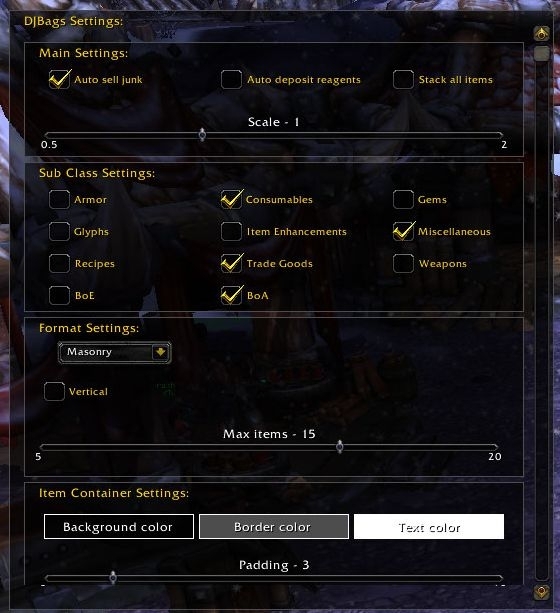 Do you plan to add an option to put boxes in a customize order? 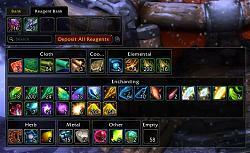 I might now that I am back to developing the addon. I just have to determine how I will do this. The easiest for me would be allowing people to provide code functions that sort the order for me. But I would prefer coming up with a way for anyone to do it in game. 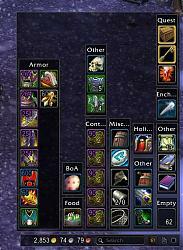 I have come to this addon after ArkInventory got too cumbersome. It's great. 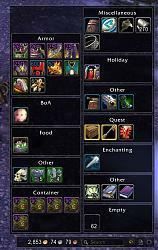 However, very recently, as in one or two days ago, I press B for opening all bags and... nothing. 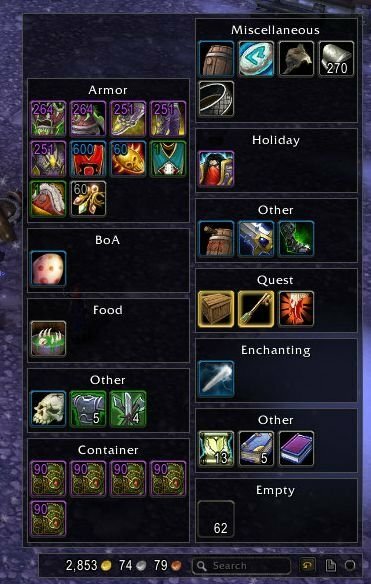 Now this may well not be your addon, but has anyone else experienced this functionality lockup? Clicking on the bag icon also does nothing. It's all very odd. Thanks so much for this addon. As another former user of Fambags(r.i.p.) you're a lifesaver. First off I would like to thank you for this addon and the work you have done to give us something light weight that organizes it's self. I used fambags for a long time for those reasons but it is no longer maintained and I had to find something new. DJBags has worked great but I would like to make a request/suggestion. Can you possibly look into creating a locking system for the bags, as the bags become full the window grows and when opening it it is always in a different position and it has become a bit irritating! Pther than that great work. 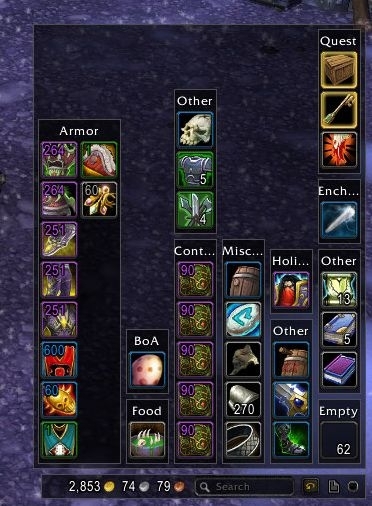 I currently use blizzards "userPlaced" setting to determine where the bag is placed. This does of course mean that it uses screen location to determine if it should use "center", "BottomLeft", "CenterTop" etc as its anchor point. Many people will ofc put it somewhere on the right of the screen (following the standard) and it tends to choose "CenterRight" as the Anchor point which means strange behaviour occurs when the bag gains or loses items (changes size). I had a reason for changing it to item link at one point but I cannot remember what it was. I believe it was a crash of some sort during the beta, but it doesn't seem to occur now. It will be in when I finally get time to find a fix for the sort lag. This makes makes a soulbound BoE not show up in the BoE container. I was thinking to myself how awful it is to spend so much time managing inventory and had sketched out an addon that I thought would be awesome. Having never made one, though, I wasn't sure where to start. I came upon DJBags and it was exactly what I had envisioned! Organizing stuff based on armor set... perfect. I do have one suggestion, though. When you go to sell stuff or transfer stuff to your bank, usually you want to click on a bunch of items in rapid succession. This is a bit hard to do because the DJBags window reorganizes after every transaction. I would make it so it only moves the icons after you close/reopen your bags or even add a button if you prefer. Other than that, it's fantastic and I've recommended it to everyone. 1. what is the row of clickable buttons at the bottom right of the whole frame / how are they accessed or assigned? 2. small suggestion-- can you add a close window / frame button? if there's a way other than the escape key, I seem to be missing it. The empty row of buttons are just empty bag slots for you to use (drop items into from a merchant or after splitting item stack). I shall add a title to them soon. The close button is a possibility, just need to find some artwork that works with the current style. And yes currently only Escape and the bag key (B as default) would close the bags.